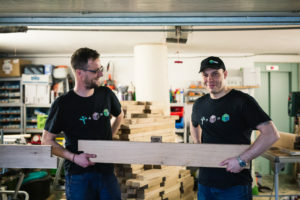 E-grow aims to Develop a prototype of autonomous raised bed, garden hose and solar panel driven by CNC machines - Farmbot and a software application based on the knowledge of ecological agriculture. They specialise in the manufacturing of massive wood raised bed gardens designed for ecological agriculture. They products are made of high quality renewable materials and are characterised by a long lifespan and original design. They also apply permaculture and ecological principles to our products. Company Parsnip s.r.o. covers a wide-range in IT businesses - they excel in data analysis and the maintenance and monitoring of web applications. Makers and Manufacturers: a match made in heaven? Both teams are made of young and passionate people, complementing each other's knowledge and expertise in ecological agriculture and IT technologies. We also share a joint vision for sustainability, ecology and innovative technologies, which pushes us forward to achieve our common goals. Our mission is to develop an autonomous and sustainable organic food production system. Our dream is to become the leader of the Slovak and European market for raised bed gardens and to involve as many people as possible into growing their own food and become self-sustainable at least seasonally. The main challenge that stands on our way is that Farmbot technology is still under development and it might have some bugs and a few limitations. However, we believe that our team will take a part in overcoming these obstacles! This project will influence the short and the long term economic growth of our company. It would also help us to extend our product portfolio and to succeed in new agricultural spheres, where we see a great potential. It might also help us to develop an automatic system of food self-sustainability. Would you like to share any interesting anecdote?